"What do you mean? Of course We love our kids, and tell them so all the time. But that doesn't mean they doesn't need discipline!" It isn't enough that we tell our children we love them. We need to put our love into action every day for them to feel it. And when we do that our kids need a lot less discipline! "But what does that mean, putting our love into action?" Mostly, it means making that connection with our child our highest priority. Love in action means paying thoughtful attention to what goes on between us, seeing things from the our child's point of view, and always remembering that this child who sometimes may drive us crazy is still that precious baby we welcomed into our arms with such hope. "Doesn't that take a lot of energy?" It takes a lot of effort to fully attend to another human being, but when we are really present with our child, we often find that it energizes us and makes us feel more alive, as being fully present with anyone does. Being close to another human takes work. But 90% of people on their deathbed say that their biggest regret is that they didn't get closer to the people in their lives. And almost all parents whose children are grown say they wish they had spent more time with their kids. "Being fully present? How can I do that when I'm just trying to get dinner on the table and keep from tripping over the toys?" Being present just means paying attention. Like a marriage or a friendship, your relationship with your child needs positive attention to thrive. Attention = Love. Like your garden, your car, or your work, what you attend to flourishes. And, of course, that kind of attentiveness takes time. You can multi-task at it while you're making dinner, but the secret of a great relationship is some focused time every day attending only to that child. "This is all too vague for me. What am I supposed to actually DO?" 1. Start right for a firm foundation. The closeness of the parent-child connection throughout life results from how much parents connect with their babies, right from the beginning. For instance, research has shown that fathers who take a week or more off work when their babies are born have a closer relationship with their child at every stage, including as teens and college students. Is this cause and effect? The bonding theorists say that if a man bonds with his newborn, he will stay closer to her throughout life. But you don't have to believe that bonding with a newborn is crucial to note that the kind of man who treasures his newborn and nurtures his new family is likely to continue doing so in ways that bring them closer throughout her childhood. 2. Remember that all relationships take work. Good parent-child connections don’t spring out of nowhere, any more than good marriages do. Biology gives us a headstart -- if we weren’t biologically programmed to love our infants the human race would have died out long ago -- but as kids get older we need to build on that natural bond, or the challenges of modern life can erode it. Luckily, children automatically love their parents. As long as we don't blow that, we can keep the connection strong. 3. Prioritize time with your child. Assume that you'll need to put in a significant amount of time creating a good relationship with your child. Quality time is a myth, because there’s no switch to turn on closeness. Imagine that you work all the time, and have set aside an evening with your husband, whom you’ve barely seen in the past six months. Does he immediately start baring his soul? Not likely. In relationships, without quantity, there’s no quality. You can’t expect a good relationship with your daughter if you spend all your time at work and she spends all her time with her friends. So as hard as it is with the pressures of job and daily life, if we want a better relationship with our kids, we have to free up the time to make that happen. 4. Start with trust, the foundation of every good relationship. Trust begins in infancy, when your baby learns whether she can depend on you to pick her up when she needs you. By the time babies are a year old, researchers can assess whether babies are “securely attached” to their parents, which basically means the baby trusts that his parents can be depended on to meet his emotional and physical needs. Over time, we earn our children’s trust in other ways: following through on the promise we make to play a game with them later, not breaking a confidence, picking them up on time. At the same time, we extend our trust to them by expecting the best from them and believing in their fundamental goodness and potential. We trust in the power of human development to help our child grow, learn, and mature. We trust that although our child may act like a child today, he or she is always developing into a more mature person (just as, hopefully, we are.) We trust that no matter what he or she does, there is always the potential for positive change. Trust does not mean blindly believing what your teenager tells you. Trust means not giving up on your child, no matter what he or she does. Trust means never walking away from the relationship in frustration, because you trust that she needs you and that you will find a way to work things out. Think of your child as a plant who is programmed by nature to grow and blossom. If you see the plant has brown leaves, you consider if maybe it needs more light, more water, more fertilizer. You don't criticize it and yell at it to straighten up and grow right. Kids form their view of themselves and the world every day. They need your encouragement to see themselves as good people who are capable of good things. And they need to know you're on their side. If most of what comes out of your mouth is correction or criticism, they won't feel good about themselves, and they won't feel like you're their ally. You lose your only leverage with them, and they lose something every kid needs: to know they have an adult who thinks the world of them. 6. Remember that respect must be mutual. Pretty obvious, right? But we forget this with our kids, because we know we’re supposed to be the boss. You can still set limits (and you must), but if you do it respectfully and with empathy, your child will learn both to treat others with respect and to expect to be treated respectfully himself. Once when I became impatient with my then 3 year old, he turned to me and said “I don’t like it when you talk to me that way.” A friend who was with us said, “If he’s starting this early, you’re going to have big problems when he’s a teenager!” In fact, rather than challenging my authority, my toddler was simply asking to be treated with the dignity he had come to expect. Now a teenager, he continues to treat himself, me, and others, respectfully. And he chooses peers who treat him respectfully. Isn’t that what we all want for our kids? 7. Think of relationships as the slow accretion of daily interactions. You don’t have to do anything special to build a relationship with your child. The good -- and bad -- news is that every interaction creates the relationship. Grocery shopping, carpooling and bathtime matter as much as that big talk you have when there’s a problem. He doesn’t want to share his toy, or go to bed, or do his homework? How you handle it is one brick in the foundation of your permanent relationship, as well as his ideas about all relationships. That’s one reason it’s worth thinking through any recurring interactions that get on your nerves to see how you might handle them differently. Interactions that happen more than once tend to initiate a pattern. Nagging and criticizing are no basis for a relationship with someone you love. And besides, your life is too short for you to spend it in a state of annoyance. 8. Communication habits start early. Do you listen when she prattles on interminably about her friends at preschool, even when you have more important things to think about? Then she’s more likely to tell you about her interactions with boys when she’s fourteen. It’s hard to pay attention when you’re rushing to pick up food for dinner and get home, but if you aren’t really listening, two things happen. You miss an opportunity to learn about and teach your child, and she learns that you don’t really listen so there’s not much point in talking. 9. Don't take it personally. Your teenager slams the door to her bedroom. Your ten year old huffs "Mom, you never understand!" Your four year old screams "I hate you, Daddy!" What's the most important thing to remember? DON'T TAKE IT PERSONALLY! This isn't primarily about you, it's about them: their tangled up feelings, their difficulty controlling themselves, their immature ability to understand and express their emotions. Taking it personally wounds you, which means you do what we all do when hurt: either close off, or lash out, or both. Which just worsens a tough situation for all concerned. You can still set limits, but you do it from as calm a place as you can muster. Your child will be deeply grateful, even if she can't acknowledge it at the moment. I'm not for a minute suggesting that you let your child treat you disrespectfully. I'm suggesting you act out of love, rather than anger, as you set limits. And if you're too angry to get in touch with your love at the moment, then wait. 10. Resist the impulse to be punitive. How would you feel about someone who hurt, threatened, or humiliated you, "for your own good"? Kids do need our guidance, but punishing your child always erodes your relationship, which makes your child misbehave more. See Positive Discipline for more info on handling your anger and setting effective limits. 11. Don’t let little rifts build up. If something’s wrong between you, find a way to bring it up and work it through positively. Choosing to withdraw (except temporarily, strategically) when your child seems intent on driving you away is ALWAYS a mistake. Every difficulty is an opportunity to get closer or create distance. 12. Re-connect after every separation. 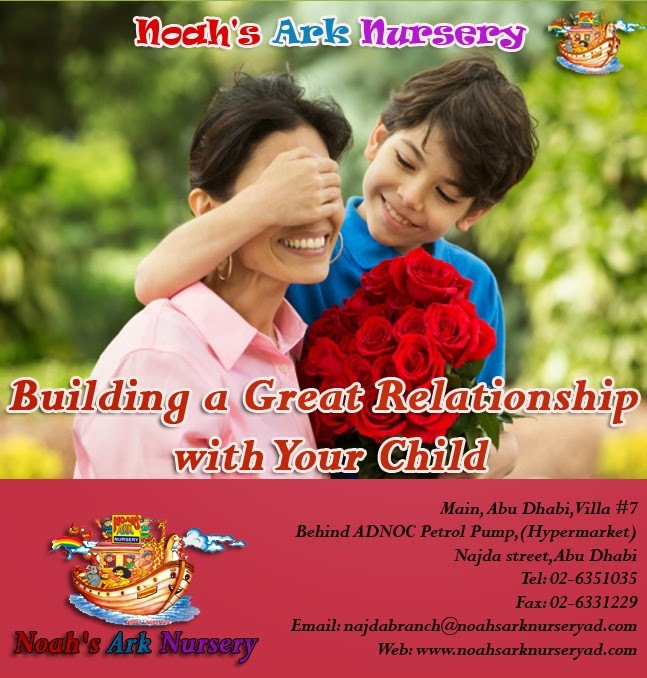 Parents naturally provide an anchor, or compass, for kids to attach to and stay oriented around. When they're apart from us they need a substitute, so they orient themselves around teachers, coaches, electronics, or peers. When we rejoin each other physically we need to also rejoin emotionally. Click here for ideas on staying connected to your child. Most kids don’t keep an agenda and bring things up at a scheduled meeting. And nothing makes them clam up faster than pressing them to talk. Kids talk when something is up for them, particularly if you've proven yourself to be a good listener, but not overly attached to their opening up to you. Being on hand when they come home is a sure-fire way to hear the highlights of the day with younger kids, and even, often, with older ones. With older kids, simply being in the same room doing something can create the opportunity for interaction. If you’re cooking dinner and she’s doing homework, for instance, or the two of you are in the car alone, there's often an opening. Of course, if one of you is hunched over the computer, the interaction is likely to be more limited. Find ways to be in proximity where you’re both potentially available, without it seeming like a demand. This may seem obvious, but stating your availability is helpful, even with teens. "I have to run to the grocery store, but don't hesitate to call my cell phone if you need me." But the most important part of staying available is a state of mind. Your child will sense your emotional availability. Parents who have close relationships with their teens often say that as their child has gotten older, they've made it a practice to drop everything else if their teen signals a desire to talk. This can be difficult if you're also handling a demanding job and other responsibilities, of course. But kids who feel that other things are more important to their parents often look elsewhere when they're emotionally needy. And that's our loss, as much as theirs.